For the new season, we have taken into account the needs of our buyers and prepared a shorter wellies version of the super popular “White & Zipper High” design. 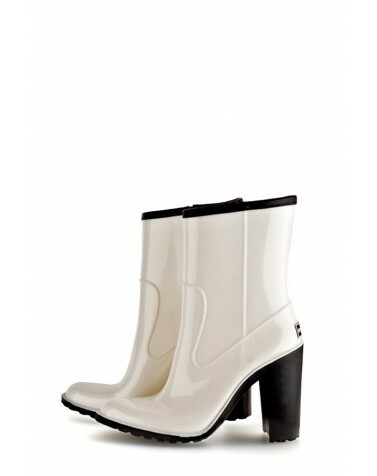 These short wellingtons offer more choice when combining with your clothes. During development we also took into account the wishes of women with wider calves. At the same time, the wellies have preserved their functionality: a high and stable heel, integrated zipper and a thin insole to keep you warm! For the new season, we have taken into account the needs of our buyers and prepared a shorter wellies version of the super popular “White & Zipper High” design. These short wellingtons offer more choice when combining with your clothes. During development we also took into account the wishes of women with wider calves. At the same time, the wellies have preserved their functionality: a high and stable heel, integrated zipper and a thin insole to keep you warm! Exclusive model from BOOMBOOTS. Limited edition! Attention! Please choose SMALLER size.